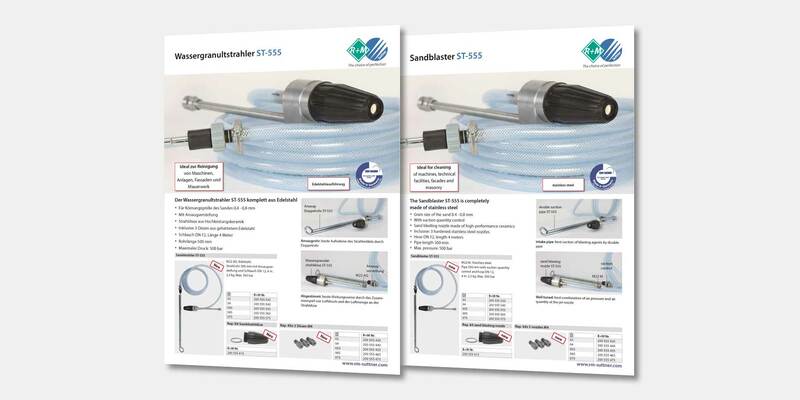 Sandblaster ST-555 – now available in DN 19! From now on, our professional sandblaster is also available in size DN 19. One tool, six blasting agents, numerous applications. Thanks to its stainless steel body, the ST-555 features utmost pressure resistance up to a continuous operating pressure of 500 bar. The three symmetrical high-pressure nozzles in the blasting head provide for a flow of the blasting agent without any deflections. This is how wear of the ceramic diffuser nozzle with TPE coating is reduced to a minimum and pulse energy of the blasting agent is used optimally. removal of rust from metals or of old coatings and paintings. Cleaning and grinding of concrete surfaces. Varnish removal. The supplied double suction pipe can be set continuously and thus enables perfect metering of the amount of blasting agent and thanks to the different nozzle sizes, the blasting head can be adjusted to the performance of the device and to the sensitiveness of the surface structure. The blasting agent hose included in the scope of supply has a length of 4 m. It can be extended to 10 m without suffering any considerable performance loss. In this case, the height difference to overcome should not exceed 2 m.
For detailed information about our sandblaster ST-555, please refer to our flyer available as PDF download.